We have started what I want to continue to be a tradition in our household on Friday nights. Friday is the one day of the working week that I have off, therefore I am available to pick my son up from school on Friday afternoons. He’s been at school for nearly one year now and we’ve never done anything concrete on Friday afternoons. Because I pick him up and we get home about 3.30pm I’ve got at least two hours extra to do stuff that I don’t have on the days I work. This allows us to come back home, have a snack, I look at his spelling test results – he’s doing pretty well by the way – and I try to elicit information about the school day from him. It’s like pulling teeth from a hen mostly but I do get some snippets. Today he had a disco so he showed me his dance moves. 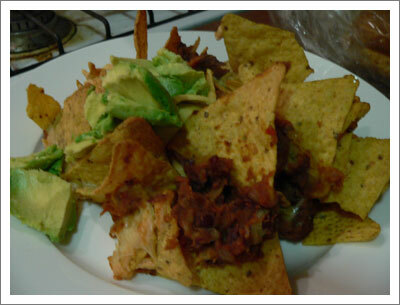 Friday nights has become our nachos night and because I prepare the bean mix beforehand I don’t have to do much to throw the nachos together. I don’t know if most people make it with meat but I make it with red kidney beans. It’s delicious, economical and easy. Here I’ve got it with avocado, but in addition to that some sour cream or even natural yoghurt is great. Therefore, because the dinner is pretty much ready and I’ve arrived home earlier than normal, I can spend some extra time with JJ. Lately we’ve started playing games to spend this time together, and to fill in some time before dinner and we’re both really enjoying it. Trouble is one of our favourites. In the last month or so, probably since we started playing more on Friday nights, I’ve noticed that JJ has become more strategic in how he plays. He used to get a piece out on the board and stick with that one until it was home and he got another one out, even if he threw a 6 in the meantime (you have to roll a 6 to get your piece into play). Now he usually takes a piece out whenever he gets a 6. Also after he rolls he sees if he can land on me to put me back at the start. We’re pretty even at winning now. Tonight he wanted to play Snap. He got his Snap cards out and we played one game very quickly where I won. I thought I’d let him win his next game but he saw right through me and even said that he could tell I was trying to let him win. My boy is getting smart. Or he’s always been smart, he’s just showing me more. He told me he started letting me win so the game would continue for longer. It made me think of a recent parent/teacher interview where his teacher said that he was no academic. I didn’t take offense because I don’t think he will be an academic sort. I think he’s smart though, just not in a book kind of way. I think he’s smart in a I know what you’re thinking and how to read you kind of way which will stand him in very good stead. Whenever I do pick him up from after school care he is more often than not playing a card game of some description and it is teaching him to listen to rules and to take turns. I’ll soon get sick of Trouble and Snap, so we’ll have to find some other games to play on our Friday nights. I think a good way of doing that is going to garage sales to find games to keep our new Friday night game tradition continuing. This is my entry for Scribbit’s June Write-Away contest. We play a lot of Scrabble–love that game!